Researchers at UT Southwestern Medical Center have created an experimental vaccine against beta-amyloid, the small protein that forms plaques in the brain and is believed to contribute to the development of Alzheimer’s disease. Compared with similar so-called DNA vaccines that the UT Southwestern researchers tested in an animal study, the new experimental vaccine stimulated more than 10 times as many antibodies that bind to and eliminate beta-amyloid. The results appeared in the journal Vaccine. Future studies will focus on determining the safety of the vaccine and whether it protects mental function in animals, said Dr. Roger Rosenberg, director of the Alzheimer’s Disease Center at UT Southwestern and senior author of the study. A traditional vaccine – an injection of beta-amyloid protein itself into the arm – has been shown in other research to trigger an immune response, including the production of antibodies and other bodily defenses against beta-amyloid. 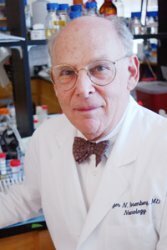 However, the immune response to this type of vaccine sometimes caused significant brain swelling, so Dr. Rosenberg and his colleagues focused on developing a nontraditional DNA vaccine. The DNA vaccine does not contain beta-amyloid itself but instead a piece of the beta-amyloid gene that codes for the protein. In the current study, the researchers coated tiny gold beads with the beta-amyloid DNA and injected them into the skin of the animals’ ears. Once in the body, the DNA stimulated an immune response, including antibodies to beta-amyloid. The next step in the research is to test long-term safety in animals, Dr. Rosenberg said. “After seven years developing this vaccine, we are hopeful it will not show any significant toxicity, and that we will be able to develop it for human use,” he said.